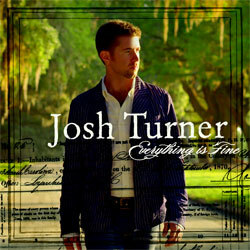 Josh Turner’s new album EVERYTHING IS FINE includes 12 songs and features the hit single “Firecracker”. Everything Is Fine will be in stores October 30th. Josh Turner is continuing to make waves in Country music since his debut with LONG BLACK TRAIN in 2003. In just a few short years, Josh has already tallied career sales of over 3 million albums (LONG BLACK TRAIN – certified Platinum, YOUR MAN – certified double Platinum), has had multiple #1 singles and videos, has been honored with multiple Grammy Award nominations (including Best Country Album nomination for YOUR MAN) and was recently named a 2007 Country Music Association nominee for Top Male Vocalist. Furthermore, he has performed at our Nation’s Capitol and has made appearances on The Today Show, Good Morning America and MARTHA - all while he and his wife welcomed their his first child into the world. For Josh’s third album, EVERYTHING IS FINE, he again teamed up with producer Frank Rogers (Brad Paisley). The album features the title-track “Everything Is Fine” and the first single “Firecracker” (Josh’s fastest moving single to date - Top 30 at Country radio in only 3 weeks). Josh blends his baritone voice on a collaboration with acclaimed R&B artist Anthony Hamilton and a collaboration with Trisha Yearwood on the soaring ballad “Another Try.” EVERYTHING IS FINE demonstrates just how FINE everything is for Josh right now. Enter every day for a chance to win!